"I AM THE LORD, THERE IS NO OTHER." Today's readings remind us that God is the Lord of the universe, subjecting all kings and principalities to himself. "There is no God besides me", says the Lord. In our first reading (Isaiah 45: 1, 4-6), God speaks to the Persian King Cyrus the Great, whom God caused to release the Jewish people from captivity in Babylon, though Cyrus did not know God. Thus says the LORD to his anointed, Cyrus, whose right hand I grasp, subduing nations before him, and making kings run in his service, opening doors before him and leaving the gates unbarred: For the sake of Jacob, my servant, of Israel, my chosen one, I have called you by your name, giving you a title, though you knew me not. I am the LORD and there is no other, there is no God besides me. It is I who arm you, though you know me not, so that toward the rising and the setting of the sun people may know that there is none besides me. I am the LORD, there is no other. In our Gospel reading (Matthew 22:15-21), the Pharisees attempted to trap Jesus into either speaking against Caesar or against God. He turned the tables on them, giving to Caesar what belongs to Caesar and to God what belongs to God. The Pharisees went off and plotted how they might entrap Jesus in speech. They sent their disciples to him, with the Herodians, saying, "Teacher, we know that you are a truthful man and that you teach the way of God in accordance with the truth. And you are not concerned with anyone's opinion, for you do not regard a person's status. Tell us, then, what is your opinion: Is it lawful to pay the census tax to Caesar or not?" Knowing their malice, Jesus said, "Why are you testing me, you hypocrites? Show me the coin that pays the census tax." 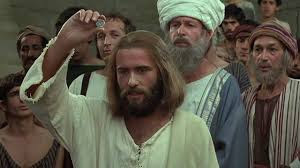 Then they handed him the Roman coin. He said to them, "Whose image is this and whose inscription?" They replied, "Caesar's." At that he said to them, "Then repay to Caesar what belongs to Caesar and to God what belongs to God." In our Epistle reading (Thessalonians 1:1-5), we hear from the beginning of Paul's letter to the church in Thessalonica. In this brief opening prayer and greeting, we hear very distinctly, the three persons of the Trinity - Father, Son and Holy Spirit. We also hear the earliest mention in Christian literature of the three theological virtues of Faith, Hope and Love. Paul, Silvanus, and Timothy to the church of the Thessalonians in God the Father and the Lord Jesus Christ: grace to you and peace. We give thanks to God always for all of you, remembering you in our prayers, unceasingly calling to mind your work of faith and labor of love and endurance in hope of our Lord Jesus Christ, before our God and Father, knowing, brothers and sisters loved by God, how you were chosen. For our gospel did not come to you in word alone, but also in power and in the Holy Spirit and with much conviction. If we consider that the currency of Caesar bears his image and inscription (the Roman coin), what then might be the currency of God - what bear's God's image, what belongs to God? Perhaps it is we, who are created in the image and likeness of God, whose inscription is written upon our hearts. We are the coins that bear God's image and inscription. "Repay to Caesar what belongs to Caesar and to God what belongs to God."